Consumers use tablets to get around the Web more than any other device, according to an exhaustive study of more than 1000 websites with more than 100 billion visitors by Adobe Digital Index. This follows an earlier Adobe study that discovered tablet owners spend 54 percent more time online compared to smartphone users, and about 19 percent more time than desktop and laptop users. This shouldn’t be very surprising. Tablets were designed to be more portable than laptops and have repeatedly emphasized their Web−friendly speed. This portability, coupled with their affordability compared to laptops, makes them the top choice for consumers whose primary goals revolve around using the Internet. 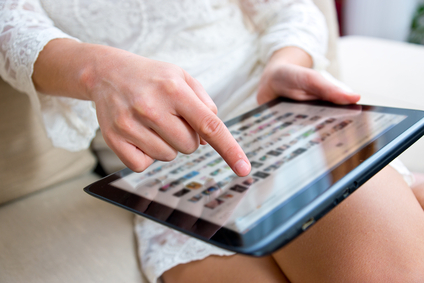 If your business is B2C and sells products from a website, it must be tablet-friendly. Purchases from mobile devices dominated the 2013 holiday shopping season, according to Business Insider, with twice as many shoppers using tablets than smartphones. If you haven’t visited your website via tablet, take the time to do so. You might notice a few features such as autocorrect and autocap functions that are frustrating to use. These are great tools for searching but terrible for shoppers filling out order forms or researchers registering to use a site. Mobify urges site developers and webmasters to turn off these functions and take other mobile-friendly steps like increasing the size and height of fonts and buttons, and turning off animation hovers. Most websites are designed for laptops and desktops. Now that you’ve used a tablet to visit your site, think about why people prefer using tablets on the Internet. If you haven’t already figured it out, it’s the touch function. This is what sold many people on tablets to begin with. In fact, touch has become so mainstream that Google’s Chrome Canary browser — designed for developers and early adopters at this stage — includes a touch function for PC and laptop screens. And according to DisplaySearch, a firm that collects and analyzes the display−related industry, shipments for touch panels are soaring. If you decide to develop a mobile site, be sure to research and get more information about features offered by different tablets. Keep in mind that touch−friendly tools will make your site much more friendly and enjoyable to tablet visitors. Tablet users are accustomed to tapping into windows, swiping to go to the next screen, and pinching to enlarge a screen. Don’t require a double−tap to open a window. Use larger fonts so that visitors don’t have to constantly pinch to see content. Make sure there is enough space between buttons for large fingers. Research to see how many tablet users are already visiting your site and compare what you find now after you launch your mobile site. Google Analytics 5 includes a feature under the Visitors menu for a Mobile option. Click on it to see the devices people used to reach your site. If you find tablets are visiting your site but show high bounce rates, then you should definitely develop a mobile site. Doug has attended every SXSW Interactive conference. He knows a thing or two about Web design.